For other uses, see Black Guard (disambiguation). 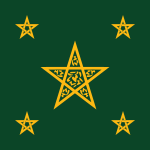 The Black Guard (Arabic: عبيد البوخاري‎‎, meaning "servants of al-Bukhari"), were the corps of West African and Moroccan soldiers assembled by the Alaouite sultan of Morocco, Moulay Ismail (reigned 1672–1727). The Black Guard descended from tribes of the south brought to Morocco from southern Africa, who were settled with their families in a special colonies, at Mechra er-Remel, to have children and to work as indentured servants. At age 10, they were trained in certain skills; the girls in domestic life or entertainments, and the boys in masonry, archery, horsemanship, and musketry. At age 15 those that were chosen entered the army. They would marry and have children and continue the cycle. Considered more loyal than Arab or Berber warriors because of their lack of tribal affiliation, Ismail's black soldiers formed the bulk of his standing army and numbered 150,000 at their peak. 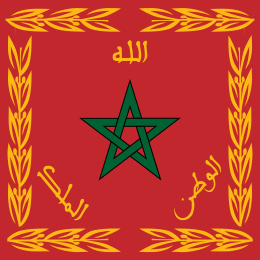 The Black Guard were mainly in charge of collecting taxes and patrolling Morocco's unstable countryside; they crushed rebellions against Ismail's rule not only by dissident tribes but also by Ismail's seditious sons, who defected from service as his provincial governors to insurrection as would-be usurpers of his throne. The Black guard were the personal guard and servants of Sultan Ismail, they might have also participated in campaigns against the European-controlled fortress enclaves dotting his empire's coast (such as Tangier, taken over after the English withdrew from it and distressed it in 1684 in response), although tasks of this kind were often allocated to European slaves (called Aluj Arabic: العلوج‎‎ plural of Alj, meaning "white christian slave") and loyal Moroccan tribal soldiers, considered more military and cavalry-able. They were well-respected, well paid, and politically powerful. Around 1697-1698 they were even given the right to possess property. Moulay Ismail always went about his court surrounded by a bodyguard of eighty black soldiers, with muskets and scimitars at the ready in case of any attempt on the sultan's life. At his throne, Ismail was attended by a servant charged with twirling a parasol above the sultan at all times (a legend says that on at least one occasion, Ismail pulled out his sword and murdered an attendant who had allowed the sun to briefly fall upon his skin). Despite endless civil wars and civil slaughter, the Black Guard remained brutally loyal and disciplined through the turmoil of Ismail's reign. More than any other factor did they enable the sultan to remain on Morocco's throne for half a century. After Ismail's death, the quality of the 'Abid went downhill, as they were no longer paid as well. Some became brigands, others quit and moved to the cities. Subsequent leaders attempted and some succeeded in resurrecting the group. However, they were never as formidable as they were in Ismail's time. The main group was dissolved in the 19th century, with only a handful left as personal bodyguards to the king. 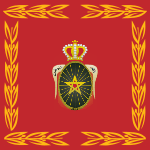 The Black Guard name was changed to Moroccan Royal Guard after Morocco gained its independence in 1956, but this unit is not composed of descendants of the black slave since its members are selected from elite units within the Moroccan Army. The descendants of the Black Guard still work as servants at the King's palace, and were considered personal possession of the king inherited from father to son until Morocco abolished indentured servitude at the start of the 20th century. 1 2 3 4 5 6 7 Hoiberg, Dale H., ed. (2010). "'Abīd al-Bukhārī". Encyclopedia Britannica. I: A-ak Bayes (15th ed.). Chicago, IL: Encyclopedia Britannica Inc. p. 32. ISBN 978-1-59339-837-8. Bakari Kamian. (2001). Des Tranchés de Verdun à l'église Saint Bernard.